Even as toddlers, Bentley and Jameson Brimblebanks hated going outside to play, preferring to stay inside pretending to know how to read and making up stories in baby gibberish language that they told to one another. This led to weekly artificial sunlight treatments to goose their vitamin D, seen here being administered by a local nurse. 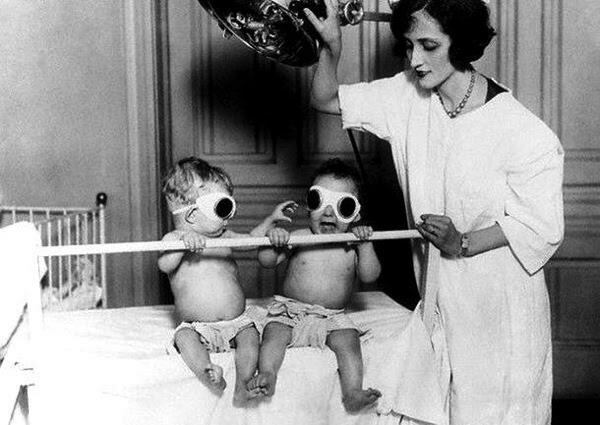 Bentley (left) enjoyed removing Jameson’s sun goggles during these sessions which eventually resulted in temporary blindness while the brothers were learning their animals. To this day, Jameson still struggles to tell the differences between duckies and bunnies. This entry was posted in vintage photo and tagged Brimblebanks Brothers, duckies and bunnies, family history, pictures. Bookmark the permalink.